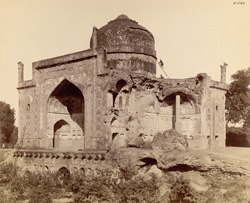 Photograph of the Chini-ka-Rauza at Agra in Uttar Pradesh, taken by Edmund William Smith in 1893-4, from the Archaeological Survey of India. The Chini ka Rauz, or Tiled tomb, is believed to be the mausoleum of Afzal Khan, a minister of the Mughal Emperor Shah Jahan (r.1628-58) who died in 1638. Built on a square plan, it has a bulbous central dome and a mosaic façade decorated with elaborate floral patterns composed of enamelled tile fragments. The building is seen here in a ruinous condition with partially exposed brickwork. This is a general view of the ruined tomb.